There are few settings as gorgeous to fly over as Jaipur. From palaces to national parks, from colourful festivals to desert landscapes, the sights and sounds of Rajasthan are stunning. You’ll feel a thrill like no other soaring through the skies in a giant hot air balloon in Jaipur. From the minute you clamber into the spacious basket below, and settle into your own private compartment, you'll feel the excitement mounting. Your ride in a hot air balloon in Jaipur gives you a unique view of the lakes, heritage forts and palaces of the royals. From the skies, especially during the dusk hours when the setting sun turns the rocks and structures into a delightful blush-coloured paradise, you'll see why Jaipur is also called the Pink City of India. You'll take off and smoothly float towards the sky, and witness the beautiful sunrise/sunset. Through your one hour flight, you will get a view of Jaipur which is unlike any you have ever seen before, with the colours on the sky and lakes and mountains all below you. You'll enjoy a 45-60 minute flight, and then will begin the landing process. Once you touchdown, the pick-up vehicle will be waiting to drop you off back to the end point. Your hot air ballooning ride ends here. 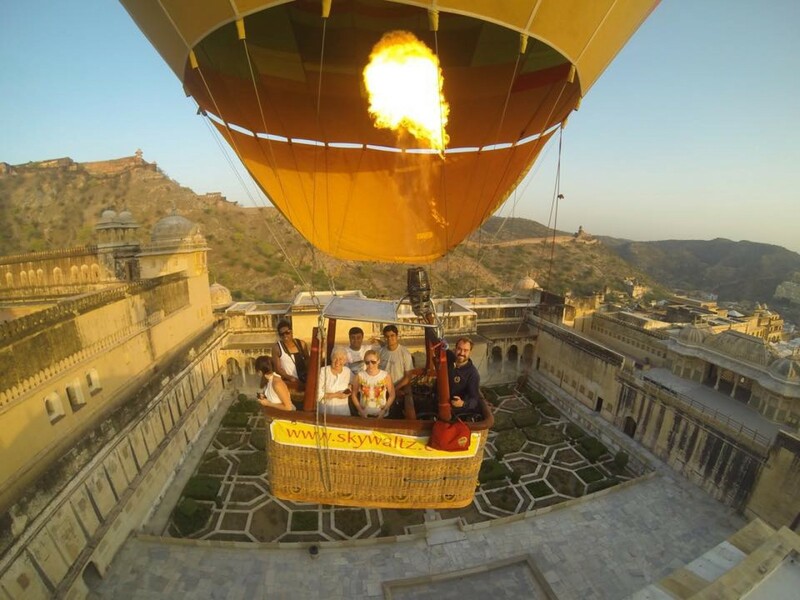 Your actual time for hot air ballooning in Jaipur is about 45-60 minutes, and you'll rise to a height of about 2000-4000 feet, depending on the weather. Do plan for about 4-5 hours for the entire adventure. Hot air ballooning in Jaipur is available only in the early morning and late afternoon, when the skies are changing colour, and when the wind and temperatures are at their best. Hot air ballooning in India is a relatively new sport and is only available in a few locations at the moment. However, it is getting increasingly popular and spreading fast. Read our blog about the Top Hot Air Ballooning Locations in India . The winter months are the best time to go hot air ballooning in Jaipur. The winds are at their best during this time, and the cool weather ensures that your ride doesn’t get too warm. However, you might like to plan your hot air ballooning in Jaipur to coincide with a big event like the camel fair, so that you can get the best views. Hot air ballooning in India can be done at several locations across India. They include Lonavala, Ranthambore, Pushkar, and Udaipur, to name a few. What should I carry for hot air ballooning in Jaipur? You don’t need to carry much for your hot air ballooning in Jaipur. Do take a warm layer if you’re flying in winter. Wear comfortable shoes, and avoid high heels or sandals. A cap or hat is often handy, and sunglasses with a neck strap are a good idea too. What is the best season for hot air ballooning in Jaipur? What is the minimum/maximum age restriction for ballooning in Jaipur?